To reproduce the issue, add a TChart to a FMX Multi-Device Application and insert the code below into the implementation section. The code below adds two custom tick marks and labels to the TChart bottom axis and sets the axis labels to be large and red. 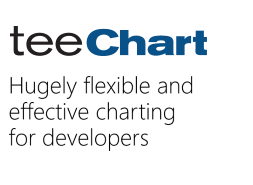 It works fine in Delphi 10.1 Berlin with Teechart Pro v2017.21.170329 32 bit FMX. It does not work in Delphi 10.2 Tokyo with Teechart Pro v2017.22.170619 32 bit FMX, where the custom labels appear at default size and in black. Is this a bug or am I doing something wrong. If a bug, is there a workaround until you fix it? Many thanks for reporting this issue to us - it is a defect which I have added to our issue-tracking database with id=1894. At the moment I cannot suggest a workaround for you, but if I discover one in the near future I will certainly pass it on to you. As a workaround, I have reverted to using the v2017.21 Teechart in Delphi 10.2 Tokyo. In other words, I am skipping v2017.22 due to this bug. Many thanks for the information. I have added the information to the bug id=1894.